Thanks to Sgt Olie K. Teeter (Tail Gunner), to 2/Lt Maurice Logsdon (Bombardier) and his family and to Chris Lancaster, grandson of 1/Lt Joseph Kubicek (A/C). This was the second replacement crew for the 40th Squadron. The original A/C for this crew was 2/Lt James C. Porter. They arrived in March. Upon their arrival at Tinian, Porter was assigned to the crew of 1/Lt Paul E. Reed (Crew #4014). In exchange, 1/Lt Joseph Kubicek (A/C), T/Sgt James D. Dowd (CFC) and Sgt Leo A. Bessette (R Gunner) had previously served with Crew #4014. 2/Lt Maurice Logsdon (Bombardier) was assigned as a replacement bombardier on Crew #4008 and then on Crew #4015 before returning to the crew. The original CFC and R Gunner for this crew are not known. Crew #4018 in front of "Dearly Beloved". Photo provided by Chris Lancaster, grandson of 1/Lt Joseph Kubicek (A/C) and by Sgt Ollie K. Teeter (Tail Gunner), all rights reserved. Standing - Left to Right: S/Sgt Olie K. Teeter (T Gunner), T/Sgt James D. Dowd (CFC), T/Sgt James L. Thornton (Engineer), Sgt Paul Chambers (L Gunner), Sgt Leo A. Bessette (R Gunner), S/Sgt Frank L. Aultice (Radio). 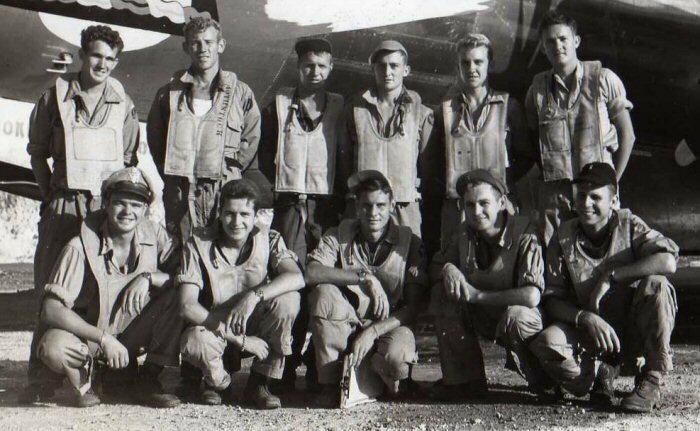 Kneeling - Left to Right: 2/Lt Maurice Logsdon (Bombardier), 2/Lt Lewis B. Perry (Pilot), 1/Lt Joseph Kubicek (A/C), F/O Donald A. Alfred (Navigator), 2/Lt Marvin V. Schylling (Radarman). 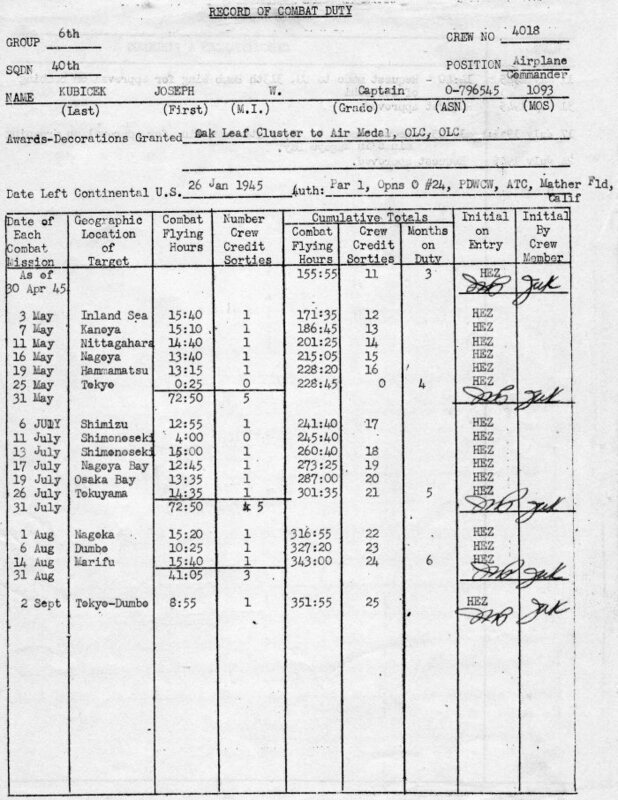 The following "Record of Combat Duty" of 1/Lt Joseph Kubicek (A/C) may list all of the missions flown by Crew #4018. Document provided by Chris Lancaster, grandson of 1/Lt Joseph Kubicek (A/C). The crew flew "Dearly Beloved - the Ramp Tramp".